1 ml of the solution contains: Human anti-D immunoglobulin 50 micrograms For excipients, see section 6.1. Solution for injections Transparent or slightly opalescent solution. After childbirth, during pregnancy and after the abortion of a foetus after the 12th week of gestation, in the threat of immature or premature labour, and after diagnostic amniocentesis after the 12th week of pregnancy, Gamma anty-D 150 should be used. Posology Indications for use of anti-D immunoglobulin applicable in a given EU Member State should be followed. 1 ampoule of the product should be administered intramuscularly up to the 12th week of pregnancy within 48 hours, 72 hours at the latest after: – idiopathic miscarriage, – abortion, – removal of ectopic (extra-uterine) pregnancy. Method of administration GAMMA anty-D 50 should be administered intramuscularly. If coagulation impairment occurs, when intramuscular administration is contraindicated, Gamma antyD 50 can be administered subcutaneously. Press the injection site gently using a swab. If intramuscular administration of a large dose of the product (more than 5 ml) is required, it is possible to administer the product in divided doses in different sites. Do not use in cases of known hypersensitivity to any of the product components. Do not administer intravenously. Do not administer to newborn infants. Do not administer to Rh-positive women (D+). The patient should be observed for at least 20 minutes after the administration. If any symptoms of anaphylactic reaction occur, the administration of the product should be stopped immediately and a suitable medical procedure followed. Real hypersensitivity reactions seldom occur. However, an allergic response after administration of anti-D immunoglobulin may occur. Patients should be informed about early symptoms of hypersensitivity reaction, including: rash, general nettle rash, pressure in the chest, a drop in blood pressure, whistling breath and anaphylaxis. The treatment is dependent on the cause and severity of the adverse reaction. In the case of shock, an appropriate obligatory medical procedure should be followed. Gamma anty-D 50 is obtained from human plasma collected from donors with a high level of anti-D antibodies. In the case of administration of products obtained from human blood or plasma, the transmission of infectious agents cannot be completely excluded. This refers also to pathogens and viruses unknown before. However, the risk of transmitting infectious agents is minimised by:  selection of donors based on clinical anamnesis and testing of both, a single plasma unit and pooled plasma for the presence of HBsAg, anti-HIV and anti-HCV antibodies.  testing of pooled plasma for the presence of the genetic material from the virus of hepatitis type C (HCV).  applied inactivation/elimination of viruses in the manufacturing process, validated using model viruses. Undertaken safety measures which are considered as efficient apply to enveloped viruses, such as: HIV, HBV and HCV. However, they can have a limited efficiency for non-enveloped viruses, such as virus of hepatitis type A (HAV) or parvovirus B19. There have been clinical experiments that failed to confirm transfer of hepatitis A virus (HAV) and B19 parvovirus during immunoglobulin use. Also, the presence of antibodies is presumed to play an important role for viral safety of the product. It is recommended, for patient’s safety, as far as possible, to record the name and lot number of Gamma anty-D 50 product together with the patient data after each application of the medicine, in order to correlate the product lot number to a given patient. immunisation with the use of a vaccine containing live attenuated viruses (e.g. measles, rubella, mumps and chickenpox) because anti-D immunoglobulin may decrease efficiency of vaccines containing live attenuated viruses. If it is necessary to administer anti-D immunoglobulin within 2-4 weeks after administration of vaccines containing live viruses, the efficiency of such vaccination can be distorted. After administration of anti-D immunoglobulin, a transitory increase in the passively transmitted antibodies leading to false positive results of serological tests for the presence of antibodies, such as e.g. Coombs test for neonates, may occur. Pregnancy The product is used in pregnant women. Breast-feeding The product is used in breast-feeding women. No effects on the ability to drive or use machines have been observed. If anti-D immunoglobulin is administered intramuscularly, pain and tenderness at the injection site may occur. Rare side effects include: fever, ill-being, headaches, skin reactions and shivering. In individual cases nausea, vomiting, a drop in blood pressure, tachycardia, allergic and anaphylactic reactions characterised by breathlessness and shock symptoms have been observed, even if the patient did not show any hypersensitivity reactions after previous product administration. Viral safety, see section 4.4. There is no data about product overdosing. Gamma anty-D 50 contains specific antibodies (IgG) against the antigen D (Rh) of human erythrocytes. During pregnancy, and especially during labour, blood cells of the foetus may be transmitted to the mother’s bloodstream. If the mother is Rh negative and the foetus Rh positive, the mother may become sensitised by the Rh(D) antigen and produce anti-Rh(D) antibodies which, in turn, penetrate the placenta and may cause a haemolytic disease of the newborn (HDN). Passive immunisation with anti-D immunoglobulin prevents Rh(D) immunisation in more than 99% of cases, on condition that a sufficient dose of anti-D immunoglobulin is administered early enough after exposure to Rh(D)- positive blood cells of the foetus. The dose of the product protects against immunisation that can occur after exposure to about 2.5 ml Rh-positive red blood cells. The product administered intramuscularly to a woman within 72 hours after miscarriage prevents the production of anti-D antibodies, and consequently prevents the occurrence of haemolytic disease of the newborn (HDN) in a future pregnancy. The mechanism of anti-D immunoglobulin activity by inhibiting immunisation of Rh(D)-positive erythrocytes is unknown. The inhibiting mechanism may be connected with the release of blood cells from the circulation before they reach their immunocompetent position, or even more with the mechanism of creating immune complexes, which recognises a foreign antigen and presents it through adequate cells in an adequate location in the presence of an antibody or without it. After intramuscular administration, the detectable level of antibodies is observed after approx. 4 hours. The maximum level is usually observed after 5 days. The half-life in the circulation of a recipient with the correct IgG level is 2 weeks. A given half-life may be different for different patients. IgG antibodies and complexes of IgG antibodies are destroyed in the cells of the reticuloendothelial system. 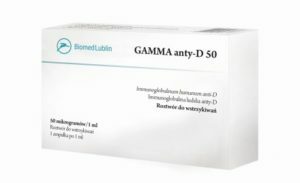 No toxicity of the product Gamma anty-D 50 has been observed in tests on laboratory animals (guinea pigs and white mice). The product must not be used together with other medicinal products. Store at 2°C – 8°C (in a refrigerator). Keep the ampoules in the external packaging to protect them from light. The product should be administered in an intramuscular injection by a physician or nurse. The product should be brought to room or body temperature before use. The solution in an ampoule should be clear or slightly opalescent. Do not use solutions that are cloudy or have deposits. Any unused product or waste material should be disposed of in accordance with local regulations.